The lower Derwent River and North West Bay can be great places to catch a feed from the shoreline throughout the year. The bays in South Eastern Tasmania boast an impressive head of cockie salmon, sand flathead, squid, wrasse, barracouta well as the odd shark or two, all available to the keen landbased angler. As you move further along the headlands, the species become larger and competent anglers can often take good bags of black-back salmon and nice sized flathead, great fun for the family while catching a feed, all within thirty minutes of home. While this article focus’ on spots thirty minutes from the Kingborough district, the techniques and lures discussed will prove effective all over the state for an array of species. 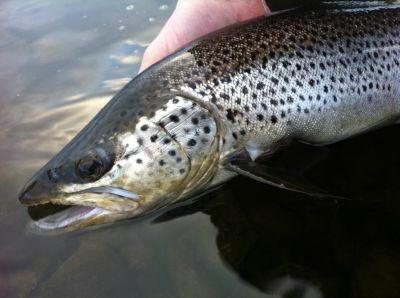 Such are the busy lifestyles these days it seems no sooner has the brown trout season closed and it is already July once again. And with that, the mind starts to ponder the first Saturday in August; where will the trout be this year in the Derwent River, what will they be focused on, will it rain between now and then, just how much baitfish will be through the system and last but certainly not least, searunners? It’s easy to forget what a great sports fishery we have on our doorsteps living here in Hobart. When I have a full day or a weekend to spare for a fishing trip nine times out of ten it will be somewhere other than my local system. This leaves me doing shorter trips from an hour to a half day on the Derwent. Some of those trips can be just awesome and it leaves me wondering how good it could get if I concentrated my efforts for a whole day or two. Hi Carl, I am a semi-regular reader of your column in the Mercury (don’t read the paper on a regular basis), but I have noticed at least two photos in recent weeks of people posing with bream which have been caught in the Derwent. The Derwent Estuary Program, which is run in part by the State Government, publishes a pamphlet on the safety of seafood from the Derwent River. I have attached a copy for you to read, but it is available at the following link. The most important take-home message from this pamphlet is that it is unsafe to consume any bream caught in the River Derwent, as the levels of Mercury greatly exceed food safety limits (see the graph on pg 2). The New Norfolk Licensed Anglers Association (NNLAA) is hold the first ever trout tournament on the Derwent River on September 7th – 8th. Run under rules and guidelines as per previously successful trout tournaments it is a catch and release event with all fish caught to be photographed on a brag mat or measure with team ID and recorded on a score sheet. Teams fish from 7am through to 2pm each day and must return and place the team key tag on the board before the 2pm cut off or penalties start to apply. Awesome find in the Derwent estuary. 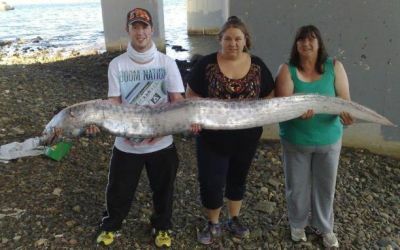 Kevin Blackwell recently discovered this oarfish washed ashore under the Tasman Bridge. It weighed 20 kilos and measured 2.2 metres in length. Kevin donated it to CSIRO in Hobart. Below are the details from John Pogonoski to Kevin. Read more: Awesome find in the Derwent estuary. 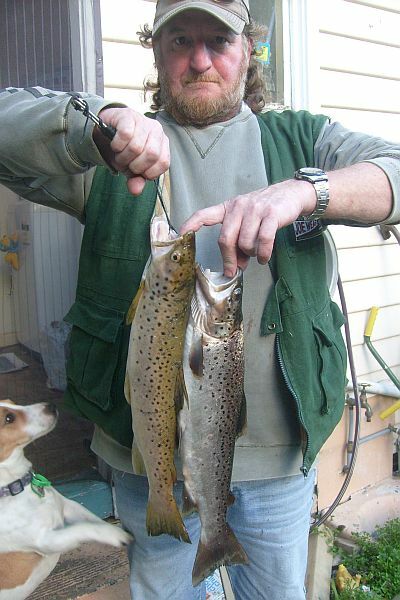 Attached is a photo of 2 trout which I caught in the Derwent River about 2km above the New Norfolk Bridge.. They were caught on opening day of the trout season during the Derwent Valley Inter-club Challenge which was run by the NNLAA, the waters being from Below Meadowbank to the Tasman Bridge. Tight Lines!! Ian Johnson - PS..we are about to eat them for Dinner!! President Reg Travers sent me this photo today. He fished the Derwent River this morning and landed four fish similar to this one, all around the four pound mark. Lure of choice was Dale's Yep Hardbodys. Anglers and boaters alike will be pleased with recent improvements to the popular Prince of Wales Boat Ramp off Gepp Parade. Jointly funded by MAST and the Glenorchy City Council the works included resurfacing and upgrading the ramp to the recommended gradient of 1:8 which will allow for all tide use. Users will also enjoy the addition of a pontoon system which will significantly aid launching and retrieving of vessels, not to mention the boarding of passengers etc. Howdy fellow Fishermen - So, after not being out to have a crack at a Bream in over 8 months, I finally got to do so over the weekend. I headed down to Hobart on Friday to pick up Isaac and head up the coast that night to chase some Bream on surface on Saturday. By the time Isaac knocked off work Friday arvo there was no need to rush to get up the coast as we were only camping to get an early start for the following day.